I spend most of my time thinking about equity splits and helping others create fair splits in their startup companies. In fact, I’d be willing to bet that there isn’t a single person on this planet who has put more thought into fair equity splits. I love the topic and look forward to continuing to pontificate about the virtues of the Slicing Pie model for years to come. You’re probably not like me in this respect. We each bet one chip. If we lose, we will lose it all. If we win, we agree to split the winnings 50/50. We hope we will win, but we don’t know if we’re going to win or how much we will win or how long we will play. The only thing we can know for certainty is that we each bet one chip. The dealer deals: two aces—niiice! The recommended call is to split the aces and bet two more chips. But, I’m out of chips and you’re not, so you put down two more. Now you have three chips on the table and I only have one. If we win, does 50/50 sound fair? Potential partner, investor or cofounder says: No way! You say: Of course not, if we win we should split the money 25/75. While our future luck in the game is unknowable, the bets are knowable. In this case the fair split is obvious and logical. Now, you agreed to a 50/50 split before we started playing. I could sue you for half and probably win. But that doesn’t make it fair. What’s fair is that you share of the winnings should be based on your share of the bets. Startups are the same thing. Instead of betting on cards, however, we are betting on ideas. Every time we contribute anything to a startup and are not paid we are essentially betting that contribution on the future value created by the company. The value of our bet is equal to the fair market value of our contribution. Just like the value of the chip in Blackjack is equal to its cash value. The chip doesn’t magically become more valuable just because it’s part of a game. The value is what it is. 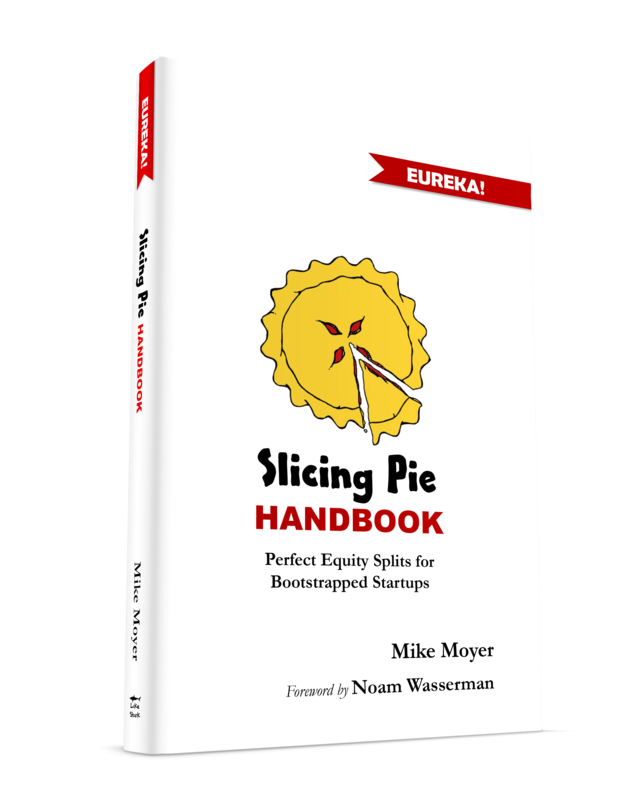 Slicing Pie bases a person’s share of the equity on the person’s share of the bets. Plain, simple, logical, obvious. That’s the basic analogy and it’s the basic concept behind Slicing Pie, it’s really not that complicated. However, it may be perceived as complicated if you start talking about cash and non-cash multipliers/normalizers and setting a fair market value and keeping track. These things aren’t very complex either once you understand them, but you have to help people understand the basics first. If he asks: what if you take another job? You: If I leave for my own reasons, I will lose equity for non-cash contributions and l’ll only be entitled to the return of cash investments if and when the company gets the money. If it were Blackjack, then I won’t share in the winnings, but you’ll pay back my bet if you do win. In the Blackjack analogy if I walk away from the table to play a different game, it won’t be fair for me to expect you to keep playing and give me part of the winnings. If you asked me to leave out of the blue, however, I would expect part of the winnings. If I was being a jerk and got booted out of the casino I wouldn’t expect part of the winnings, but I would expect my chips back if you won. If she asks: Can’t we keep 51% and split up the rest using Slicing Pie? You say: No. If this was a game of Blackjack and I told you that I was going to keep 51% of the winnings and we would split the rest based on our bets would you still want to play? You say: Of course not, it wouldn’t be fair. She says: What if we add more people? She says: But we were there first, don’t we deserve more? You say: No, chips don’t magically become more valuable because they are sitting on the table longer. If you’re getting too much push-back there is a chapter in The Slicing Pie Handbook that covers overcoming objections in more detail. You can also find it here. Or you can put them in touch with me. Questions and concerns are usually a good sign that the person is trying to fully develop his or her understanding. The key to using the analogy is to shine a light on the logic behind Slicing Pie and the flaws behind other models. If you can get them on board, all of their concerns can be addressed. If you’re dealing with someone who gets it, but still wants a fixed split, you can walk away from the table!